Abstract: The minimum amount of memory you should be running a computer with is 2GB RAM, even if you're only running Microsoft WindowsXP. If it's Microsoft Windows Vista, even more memory may be required! We're finally starting to see games that truly push the limits of modern computer hardware. Titles like Supreme Commander, Command and Conquer 3 and STALKER can really stress a PC. Besides having a lot of CPU power to go around and a good videocard, these games require a lot of system memory. The minimum amount of memory you should be running a computer with is 2GB RAM, even if you're only running Microsoft WindowsXP. If it's Microsoft Windows Vista, even more memory may be required! I've noticed that extra memory helps when I play my favorite game titles, and particularly so if you like to play with all the eye candy maxed out. More memory is a must! If you're looking for some new higher capacity memory to upgrade you computer with, you'll easily find dozens of 2GB memory kits available, enough to fit whatever budget you've got to work with. In this review PCSTATS will be testing out a new kit from Patriot Memory, it's a 2GB set of dual channel DDR2 memory which is rated to run at DDR2-1150 (PC2-9200) speeds, with 5-5-5-12 memory timings. Patriot Memory call these bad boys the PDC22G9200ELK, and you can bet we were eager to put them through a few rounds of benchmarks. 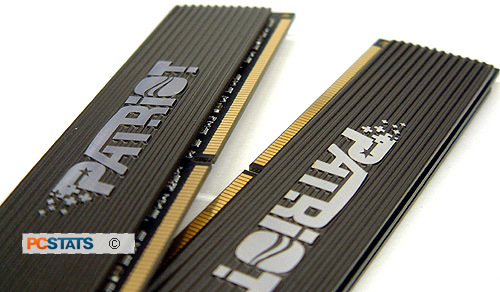 Patriot wrap their memory modules with a lifetime warranty as well as free technical support. With a retail price of $319 CDN ($300 USD, £151 GBP) the Patriot PDC22G9200ELK PC2-9200 memory kit is rather aggressively priced too. The Patriot PDC22G9200ELK comes equipped with grey coloured aluminum heat spreaders which as I'm sure you know are mainly decoration at stock speeds. When overclocked with higher voltages, heat spreaders are a must. The hardware on the Patriot DIMMs do a decent job at keeping the tiny DDR2 BGA DRAM modules cool. This Patriot PDC22G9200ELK memory kit is rated to run at DDR2-1150 (PC2-9200) speeds with 5-5-5-15 timings at a voltage of 2.3V. The Patriot memory kit does not support nVIDIA's EPP, so if you're a novice at overclocking make sure you check out PCSTATS' guide at overclocking memory . It will help you through the twists and turns of overclocking, and should allow you to get a decent boost from your computer. One way to gauge how well a manufacturer feels about its products is by the warranty it offers. 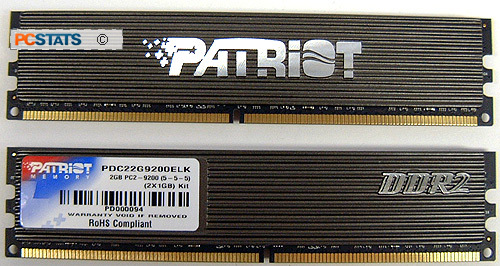 With a lifetime warranty on the Patriot PDC22G9200ELK memory kit, you can tell that Patriot believes in this memory. It definitely means peace of mind.